Being an active member of "the Devil's whore" forum, I was pleasantly surprised to find this little gem that Schizophrenic made, based on the my music vid that I've posted on you tube a while ago. It is off course, absolutely perfect for this post! A music video dedicated to Edward Sexby, as portrayed by the talented John Simm in the drama series the Devil's whore. Music: U2, with or without you. Synopsis: The 10th Doctor and the recently revived Master arrive in an ancient Roman town where they are invited to a dinner party where the guests tend to disappear even before the first course is served. Synopsis: The tenth Doctor, guided by what remains of the white point star, tries to find the Master who is imprisoned on a planet that was doomed by its creators. Set after the End of time, non-canon. Captain Jack accidentally maroons the Master as the human Marcellus in ancient Rome where he is sold into slavery. Will the Doctor be able to save him? Contains adult content and is not suitable for readers under 18. 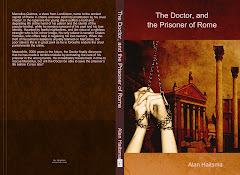 This original Doctor Who novel is now available at LULU.com. Click on the image to get to the site. Donna is destined to bring the Master back to life, but was it ever her true intention to restore this dangerous Timelord to former power? This original novel is now available at Lulu.com. Click on the image to get to the site. "In this World you cannot change" is the second and last part of the Story of a lost Timetraveler series, which is previously published by the same author. In book II the fate of Donna and the future Master will finally be revealed in a heartstopping climax. For a copy, click on the image. Sam in Ashes to Ashes?